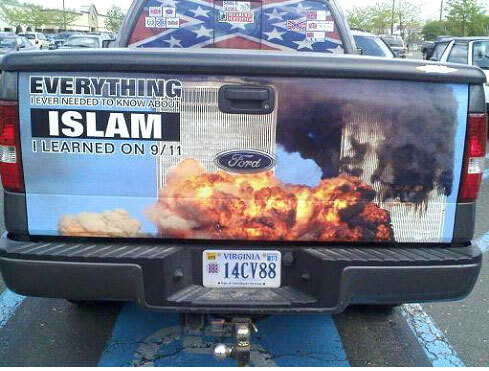 There's a guy in Virginia who really hates Islam. You may have seen this photo of his truck that went viral. Accompanying a picture of the World Trade Centre burning is the statement "Everything I Ever Needed to Know About Islam I Learned on 9/11". This entry isn't about this guy's hateful statement about Islam, it's about his license plate number. I took one look at the 14 and 88 in his license and knew it was racist. And guess how I knew? Earlier this year, I wrote a little something about the Subbanator fans who wore blackface to a Habs game. One of the gentlemen in blackface began commenting, and we started communicating via email. His handle on my blog was "wantthis1488". I had no idea what 1488 meant until commenter matt left this comment. go figure. a guy with 1488 in his name doesn't think this is a problem. The 14 words and 88 is Heil Hitler. That's when I learnt 14 and 88 were numbers that mean more than meets the eye. The number 88 stands for the eighth letter of the alphabet, H, doubled to signify "Heil Hitler" and 14 is code for imprisoned white supremacist David Lane's 14-word motto: "We must secure the existence of our people and a future for white children." I asked the Subbanator guy outright if that's where he got the 1488 in his handle and he convinced me it was actually his hockey and football numbers put together. But this Virginia guy, he's not fooling anybody. Thanks to the exposure this picture has received, his 14CV88 personalized plates have now been rejected by the Virginia DMV.